A visitor to the Ceatec 2014 tech expo outside Tokyo checks out Sharp's latest prototype 8K display. Japan aims to begin 8K broadcasts in 2018. Microsoft is looking beyond 4K with Windows 10 and bringing 8K support to the OS, years before TVs, monitors and content for that display resolution become widely available. The 8K support for Windows 10 will be for displays larger than 27 inches, according to a slide presented at Microsoft's WinHEC trade show in Shenzhen, China, last week. Large-screen TVs based on the 8K resolution have wowed many at trade shows like CES, but it's still many years away from adoption. Users are still moving to from conventional HD to the new 4K standard, and it could be many years until PC displays start supporting 8K. 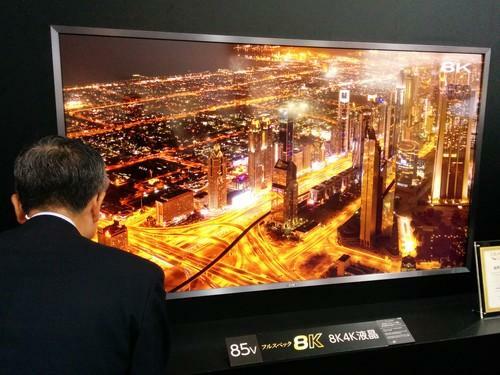 All major TV makers have shown prototype 8K displays. Japan's NHK is testing 8K broadcasts in time for the 2020 Olympics, which will be held in Tokyo. 8K displays will show images at a 7680 x 4320 resolution. Support for 8K will be built in to Windows 10 for PCs, and 8K monitors will need to be attached to display ports. PC makers may also come out with 8K all-in-ones in the future. TV makers have already proposed a new SuperMHL connector for 8K video, and the Video Electronics Standards Association (VESA) has proposed the Embedded DisplayPort (eDP) 1.4a standard to support 8K in laptops, mobile devices and PCs. Windows has always been a strong gaming and multimedia platform, and when 8K does come out, enthusiasts like gamers won't have to wait for a new OS to support that resolution. But PCs would need beefy hardware, and native Windows 10 support could encourage the development of advanced hardware. Graphics card makers Nvidia and AMD support 4K at acceptable frame-per-second rates and are also working to support 8K. It may take many years for 8K to become practical, so meanwhile Microsoft has prepared Windows 10 for 4K. The OS will support 4K resolutions on PCs with screen sizes of 8 inches or higher, and on small-screen tablets and smartphones with screen sizes of 6 inches and higher, according to a slide from the presentation. The OS supports the 4K video codec HEVC (High Efficiency Video Coding), also called with H.265, which is being promoted by the International Telecommunications Union. Microsoft in its slides made no mention of a different 4K video codec called VP9, a royalty-free video standard from Google already being adopted by major TV and chip makers. Microsoft also shared details about PlayReady 3.0, a Windows 10 digital rights management platform to secure video and streaming content. PlayReady 3.0 will use a hardware-based technology to protect content streams to tablets, smartphones and PCs.